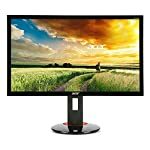 Looking for a big 27″ screen with a QHD 1440p resolution? Been put off by the prices? Then the Q2778VQE could be your next gaming monitor! 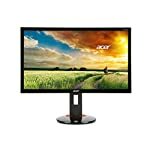 The AOC is a well priced larger QHD screen with a lot of potential. Many of us are tired of the old Full HD and we’re ready to move onto the new era of game screens. But do note, the extra pixels you get on a 1440p screen require a lot of extra grunt to move them around, you’ll need a decent graphics card to good get frame rates on a high res screen. But if that doesn’t put you off, read on. 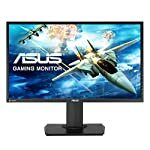 The Q2778VQE is a traditional looking monitor that doesn’t really stand out above the cooler looking monitors of the day in my opinion. It’s made of a glossy black plastic that will be a magnet for finger prints and dust, and the bezel is much thicker than some of the zero frame designs we are seeing on the market. Of course this may not be a problem for you, it’s not going to look out of place on your average desk whether at work or at home. Whilst the stand is thankfully solid enough allowing for wobble free gaming, it isn’t as adjustable as we’d like. In fact you are limited to just a vertical tilt adjustment so if you are in need of height or rotate options you’ll not find them here. On the plus side there are the standard VESA mountings so you are free to mount it on your own stand. You get all the standard connectivity, HDMI, VGA, DVI, DisplayPort, and even a headphone socket. The AOC can achieve great colour reproduction with appropriate calibration. And even the out of the box colour accuracy will be good enough for most gamers with a crisp, stable image. As is often the case with TN panels, the viewing angles aren’t ideal with the vertical image particularly suffering. Of course this is a typical limitation of the technology and is a trade off with game ready fast response times. Gamers will enjoy the fast response times and the additional OverDrive technology will help reduce ghosting. But this monitor also holds up on desktop apps too, it’s no one trick pony. We give the AOC Q2778VQE a 4.5 out of 5 rating. Want to know what existing owners of the monitor think? You can read real user reviews here. 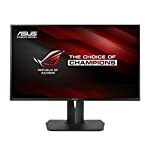 Should I buy the AOC Q2778VQE?